2 cups of egg beaters egg substitute. Place the potatoes in the casserole. 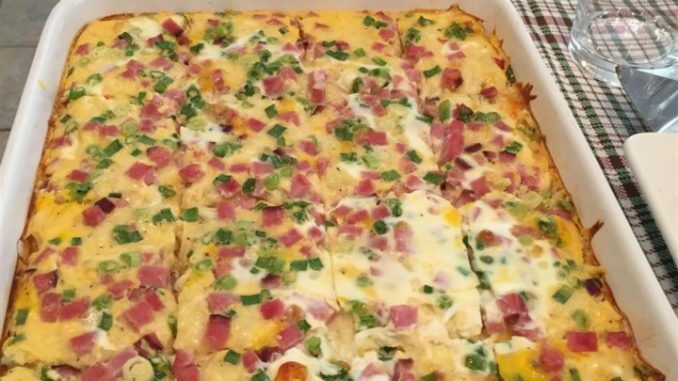 Top with ham, cheese and green onions. Mix together the egg beaters, evaporated milk, salt and pepper in a large bowl until well combined. Then pour over the potato mixture. In a preheated oven to 375°, bake for 45 to 55 minutes. Let set before cutting to 15 equal portions. Simple, easy and super delicious! You won’t believe how good this farmer casserole is. My family was so pleased to have this for breakfast. Give it a try, you will love it!